Supporting our increasingly mobile, device-driven culture doesn’t mean tech managers have to give up control. Last fall, Cisco and Apple announced that the two companies were working together to make their technologies play better together in the sandbox—and thus, the enterprise. The official press release underlined the “seamless experience” that would result for those integrating Cisco networks with iOS, and industry pundits waxed poetic about whether or not Apple was finally getting serious about delivering truly enterprise-grade solutions. But for Stacy Saxon, senior director of unified communications at Vaddio, a UC and collaboration products developer based in Minnetonka, Minn., the Cisco/Apple relationship is also good news for security as it applies to BYOD. In organizations where BYOD means that employees are truly bringing their own devices to work––that is, devices they have purchased outright––tech managers stand to field fewer support calls because people tend to know how to use technologies they’ve personally invested in, notes Chris Fitzsimmons, product manager at Biamp Systems, in Beaverton, Ore., which manufactures its Tesira line of digital signal processors, and Oreno mobile control software. And if the device is one’s own, one will probably take good care of it. Saxon notes that with BYOD comes the user’s desire for flexibility––not just in terms of what devices they use to get their work done, but which applications they run. Some organizations may prefer Skype for Business, for example, while others favor Jabber, or Blue Jeans, or WebEx. She highlights that Vaddio’s collaboration solutions––such as HuddleStation––are USB-based, which allows for this flexibility of choice, and because these systems are IP-addressable, IT departments may manage them remotely. All this said, there is no question that BYOD places significant demands on tech managers. But Fitzsimmons reminds us that there are different dimensions of BYOD––and tech managers don’t necessarily have to give up all their control. Some companies, for example, may allot their employees budgets to procure their preferred devices, provided they meet certain specifications and support certain protocols. “So tech managers who do, perhaps, have BYOD foisted on them by senior executives can make their lives a bit easier by [establishing some] rules,” he said. Tech managers may also opt to apply some ground rules to control bandwidth demands within their organizations. “If we’re talking about VoIP traffic, that’s not really that bandwidth-intensive in the context of modern infrastructure, but if a bunch of people are using their own devices at lunchtime to watch Netflix, that can become an issue,” Fitzsimmons illustrated. To get around this, tech managers may opt to limit access to these sites, or block access to them entirely. One of the trickier things to control are not the mobile devices being used in-house, but those that are in the hands of visitors. Fitzsimmons cites Biamp’s own approach to this as an example: guests coming into Biamp’s facilities may access a secured Wi-Fi guest network that is isolated from the company’s corporate LAN. 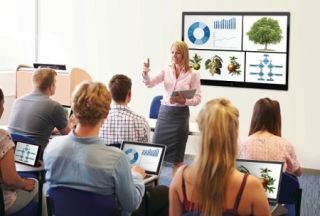 “That is one way of managing that––either physically or logically isolating devices from where you don’t want them to be,” he said, adding that Biamp often recommends this method for organizations using Oreno to control their conference rooms. Shortly after the Apple/Cisco announcement, Apple released iOS 9––a welcome update for many, not so hot for those who had been accustomed to using iOS mirroring functionality during collaboration sessions, only to discover that upon updating their devices, certain mirroring capabilities existed no more. This leads to a bigger question: when it comes to managing updates, what’s a tech manager to do? Even if the devices are company-owned, keeping them up to date––or operating on the version the IT department wants them operating on––is a considerable endeavor, especially when there are so many variables out of the tech manager’s control. Epson representatives shared that Apple has never allowed screen mirroring natively using their iPad and iPhone devices. Users can only do this with an external device (speakers or TV) via AirPlay software and AppleTV hardware (you need them both). There are third-party apps that can do this using less than official methods. The iOS9 update makes it difficult for these third-party apps to use AirPlay to mirror their screen. Carolyn Heinze is a regular contributor to NewBay Media’s AV Technology magazine.